A large construction project such as a major league sports stadium can include significant expanses of runoff- generating hardscape. A venue capable of seating nearly 70,000 people requires large grounds and parking areas. If rain can turn a football field into a mud pit, it can also turn a parking lot into a floodplain. Draining that area effectively and treating the runoff is a basic function that should be provided from the very beginning of the project, but it can present challenges. The new San Francisco 49ers Stadium in Santa Clara, California is a case in point. The new stadium moves the team out of Candlestick Park in San Francisco, into a location with about double the stadium square footage, better freeway access, and more than twice the parking spaces. Parking lot runoff always carries with it petrochemical pollutants that drip or leak from vehicles, as well as litter and other debris. The new stadium sits adjacent to San Tomas Aquino Creek, which flows directly into the Guadalupe Slough and San Francisco Bay, sensitive ecologies less than six miles away. The site is on land with a high water table, and existing storm-drain lines are not very far below the surface. An infiltration system would not work. To handle stormwater in the parking lots, access roads, and other hardscape surrounding the stadium, project engineers GHD Engineering, San Francisco (formerly Winzler & Kelly) selected the BioMod biofiltration system, a stormwater collection and natural treatment system made by industry leader Oldcastle Infrastructure. The stadium site will have six biofiltration systems, in parking lots and in the grounds immediately adjoining the stadium itself installed at the very outset of the project, even before the contract for stadium construction had been awarded, which added to the overall challenge. Biofiltration is one of the simplest, most natural, and cost-effective ways to collect runoff and treat it onsite, and it is considered a best practice under U.S. Environmental Protection Agency (EPA) guidelines for Low-Impact Development (LID). BioMod is a modular system of precast concrete biofiltration units. The fully deployed system looks to the casual observer like nothing but a flower bed or tree-planter, with the earth-level somewhat lower than the surrounding pavement. Beneath the surface, it is a series of concrete cells filled with layers of mulch, biofiltration media and drainage rock, with pipe in the bottom to carry treated water out of the system. The surface-level of soil in one of these biofiltration modules is about 6-inches below pavement-level, to provide ponding depth. In storm conditions, water runs into the modules, ponds, and percolates into the media, where it is naturally filtered along the way. The filtered water is collected in a perforated pipe that runs through the bottom of the biofiltration system and carries water into a storm drain system. Filtered pollutants are naturally broken down by microbes and provide nutrients for the plantings in the module. Plants and trees are irrigated by the rainwater. In locations where rainfall may not be frequent or consistent enough to sustain them – such as the 49ers stadium – integral drip-lines that are built into the modules can deliver supplemental irrigation water. BioMod module types include basic units (used with small ornamental plantings), tree modules, pre-filtration units, light pole modules, and custom modules for special situations. Pre-filtration modules have an upper chamber designed to collect litter and other solid debris, and detain it so it does not interfere with drainage. Pre-filtration units must be periodically cleaned to dispose of collected debris. Overflow drains are built into selected modules to handle extremely heavy rains. During unusually high flows, when the ponding depth is filled and cannot be drained fast enough through the filtration media to keep up with rainfall, the parking lot must still be protected from flooding. Excess water then goes into the overflow drains and directly into the stormwater system. The stadium system was designed to handle a 10-year rain event. Having an integrated overflow bypass built into the biofiltration system eliminates the need to design and install a separate peak conveyance system, as is often necessary with other biofiltration setups. The biofiltration system prevents hazardous conditions and collects water so it does not erode the surrounding landscape. Simultaneously, it is treated so it can be safely reintroduced into the landscape or drained into the creek, the natural drainage basin of the area. Pollutants are kept out of the bay, but no chemicals are used, there are no moving parts to maintain, no energy is consumed to do it, and maintenance is minimized. The high water table of the site was a primary challenge. Even though BioMod closed-bottom modules would be able to filter runoff without interference from existing groundwater, the runoff system would have to tie into the existing, shallow storm-drain lines, dictating that the drain system could not go very deep into the ground. Modules for the 49ers stadium had to be custom designs that are slightly shallower than standard BioMods. The reduced filtration depth available had to be compensated for in the overall design of the drainage system by increasing bioretention surface area. The first system installed includes special units for that purpose. These sections are more than twice as wide as standard BioMods, and are laid out perpendicular to the main system, with a large rounded end for aesthetic purposes and to allow for easier entry to neighboring parking stalls. The shape has been described as resembling a hockey-stick. The architect designed the side walkway of one parking lot with a shallow S-shaped jog in its otherwise straight path. The biofiltration system runs along the edge of this walkway, and follows the jog. This required custom modules. None of the custom pieces caused any production delays or presented any problem to fit into the modular system. The kickoff to construction at the stadium site was to create the parking lot on the east side, next to the training field. It will serve the parking needs of construction activities, plus those of the 49ers’ team offices. It was started in January 2012, months before the official ground-breaking for the stadium. The lot has two biofiltration systems. The one on the north side, featuring the wide, rounded special modules, was manufactured and installed first. The main run is 2.5-feet wide and just over 600-feet long, mostly basic curb-cut units without pre-filtration. The hockey-stick modules that lie perpendicular to the main run are 7-feet wide. They divide the parking lot into six drainage management (DMAs) areas, each comprising about 100-feet of the main run, and each draining 7,500-10,000 square feet of parking and walkways. Installation of the BioMod units was relatively simple. The excavation was cut to the proper depth and leveled, and the units set in place. Sections weighed 10-13 tons. Joints between sections were sealed with a specialized tape and adhesive. The tops of the sections include holes for dowels to attach to adjacent pavements. At the ends of the U-shaped sections, a small amount of fresh concrete was required to fill around curves. Perforated pipe was laid into the bottom and connected to the overflow drains, and the system was ready to be filled with drainage rock and filtration media. The drainage rate is determined by the surface area of the bioretention system and by the composition of the filtration media. The system does not require proprietary biofiltration media. For the 49ers stadium, engineers accordance with the Contra Costa County requirements. Other growing media blends are capable of drainage as high as 100 in/hr, where required. Computed against the size of the lot and the predictable rainfall, the size of the required bioretention system can be calculated. However, the media must be selected not only for drainage characteristics, but also for compatibility with the intended plantings. The greatest challenge of the first phase proved to be timing. The underground contractor had a mere 70 days to install the system and tie it into an existing stormdrain, or pay liquidated damages of $25,000/day for every day the project ran over. Use of the BioMod system helped him meet this deadline. The modules for the first system were manufactured and delivered in under six weeks. The second system was installed later, with a mere two weeks production time for 55 modules. The two systems will be fully installed, filled, and planted by early June 2012. The contractor noted there was a learning curve, but it was a fast one. They installed 120-feet of the system on the first day. By the fourth day, they set 480-feet in a day with a single crew. The second, main phase of the project includes four more bioretention systems: two in a large parking lot south of the stadium, and two lining the walkway area surrounding the main entrance to the stadium. Onsite parking for the public will include about 10,000 parking spaces. A total of over 2,500 lineal feet of BioMod cells, approximately 14,000 square feet of bioretention area, will drain the overall stadium site. While the standard bioretention modules used in most of the 49ers project are 3-feet wide, two systems in the second phase feature tapered plans: one is 3-feet wide at one end and 14-feet at the other, an irregular wedge over 300-feet long. The other is 230-feet long and rectangular over most of its length, with a subtle taper at the south end. The main entrance to the stadium runs between the two systems, and the area they drain is immediately outside the luxury boxes. The unusual shapes were designed by the architect with specific visual goals, helping to define the focus of a key space in the stadium’s grounds. One of the great advantages of a biofiltration system is that it is easy to maintain and essentially self sustaining. It harnesses the method by which nature breaks down petrochemical pollutants, a process that needs little help from us. Debris must be occasionally removed from the system, and plants must be maintained like any other landscaping, but little more is necessary. 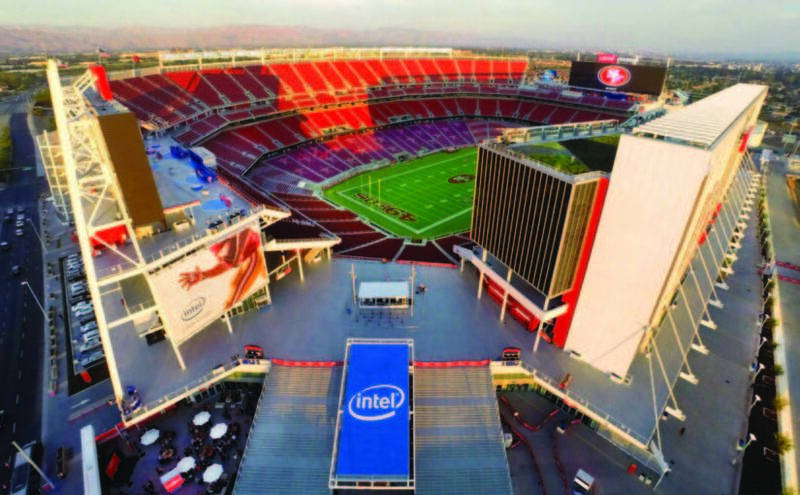 The San Francisco 49ers biofiltration system will largely maintain itself, keeping the grounds looking good and safe from flooding, and protecting the San Francisco Bay and sensitive areas surrounding it from contamination.